With Corey Seager now on the minds of just about every Dodger collector in the universe, I thought I would take a moment to run through a checklist of some of the earliest and likely most sought after Corey Seager cards in the hobby. BTW, Cardboard Connection has a fantastic list of his Top-10 cards that you can check out here. 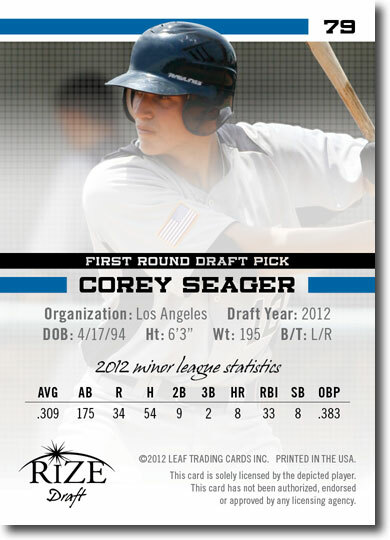 Featured below are most, if not all, of the Corey Seager cards produced from 2010 to 2012. 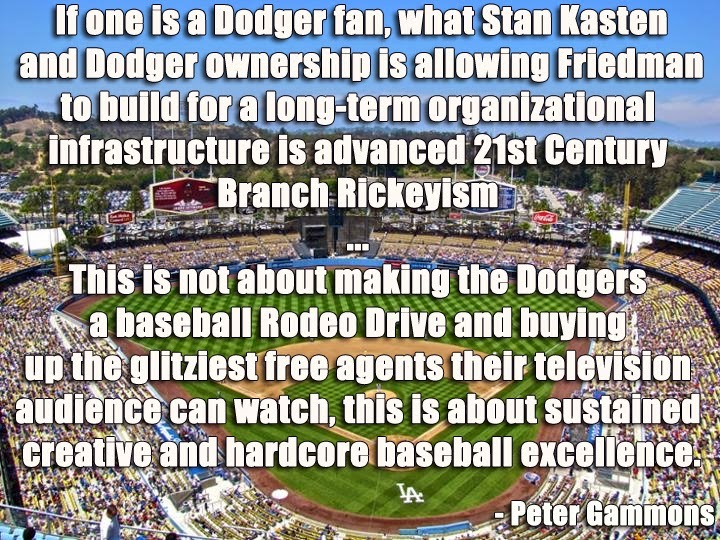 Please let me know if I missed anything. As most of you know, Seager was drafted by the Dodgers in 2012, but that doesn't mean he is without any cardboard gold during his prep years. 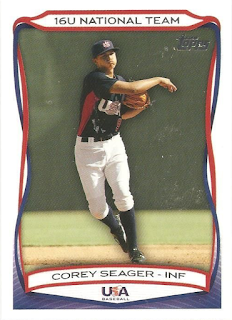 In fact, he had been scouted and pursued by the collecting public several years before becoming a pro. 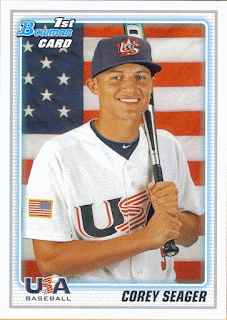 In 2010 he was a member of the Team USA Under 16 club, so Topps included him in a couple of sets. His very first Baseball card is in the 2010 Bowman Chrome Draft Picks & Prospects set. 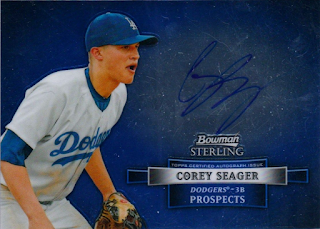 There is a base card (as seen on the left below) and a companion autographed version (seen on the right below). There is also a game-used relic card. 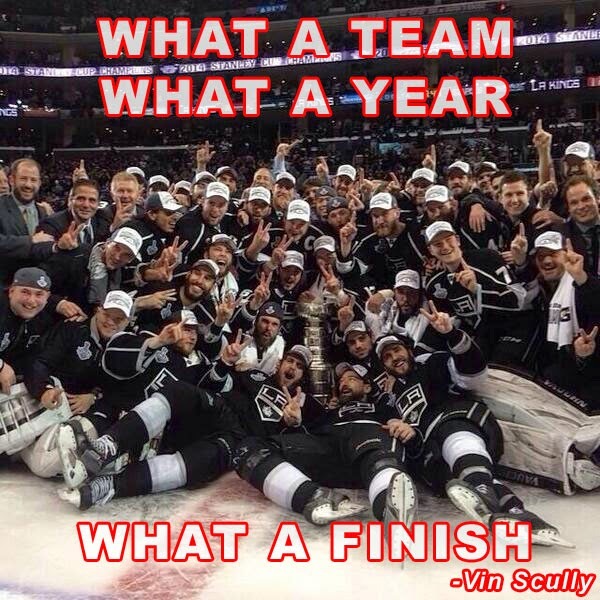 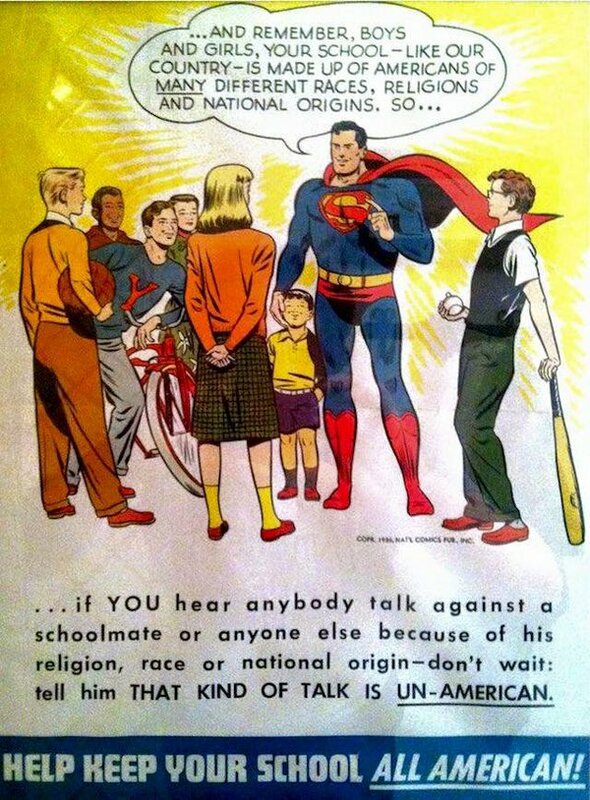 Of course, numerous parallels are available. 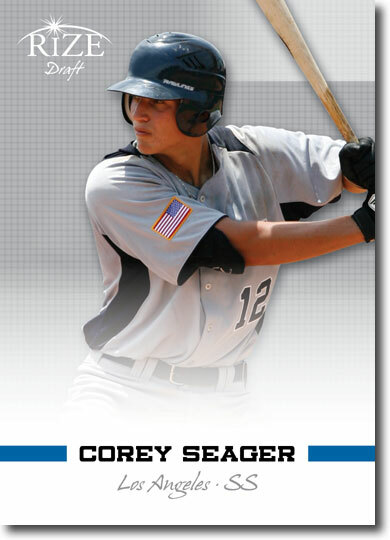 Seager was included in the 2010 Topps USA Baseball set. See his cards below. 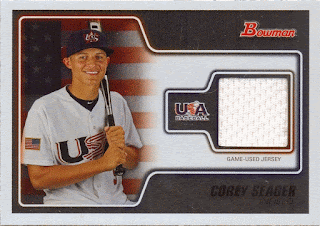 There is also a Corey Seager relic card available in this set, but I am uncertain how many different kinds are available. I've been unable to find a fully comprehensive checklist for this set. 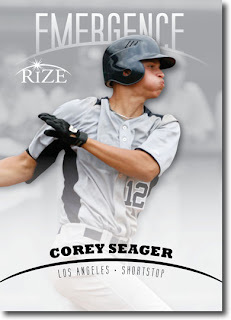 Below is a triple relic card, and I imagine there has to be a double and single relic available. Unfortunately, I'm not quite sure of that. 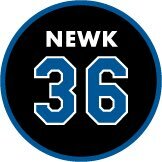 If you happen to know please pass that knowledge along. 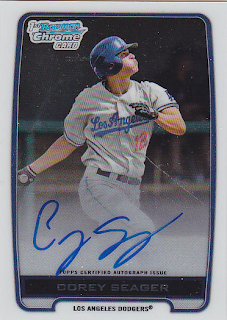 This next card might be the most obscure Seager card in the hobby. Produced in conjunction with a 2011 high school showcase/prospect event held in early August in San Diego, Topps came out with Perfect Game as a sponsor to meet, photograph and produce a limited run of cards for all of the participants (46 players). Approximately 14,000 total cards (just over 300 sets total) were given out to those who attended the showcase event in San Diego. 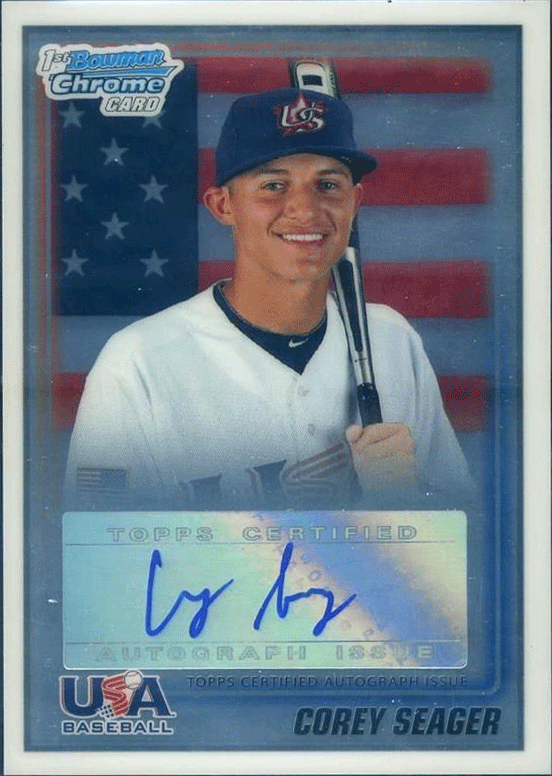 Please note that the cards where original given out unsigned, so the card (directly below on the left) was signed in-person at a later date. 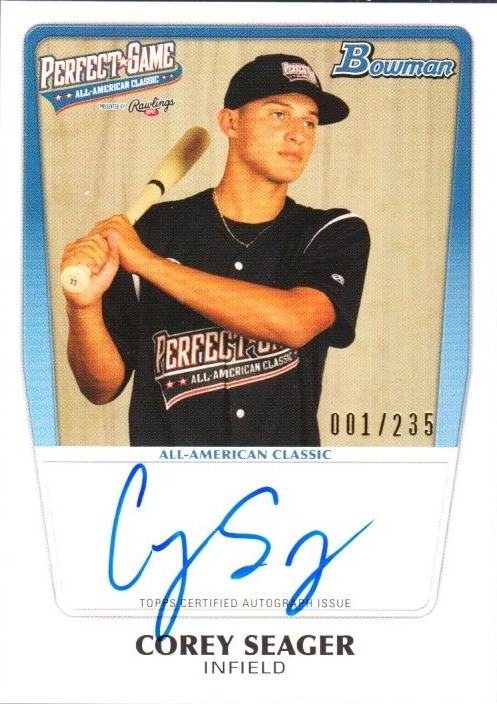 It has not been certified authentic by Topps. 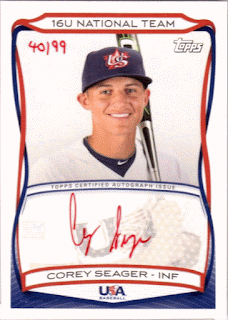 Instead, the certified Topps cards, the 235 indicated above, was later distributed into packs of 2014 Bowman Baseball. 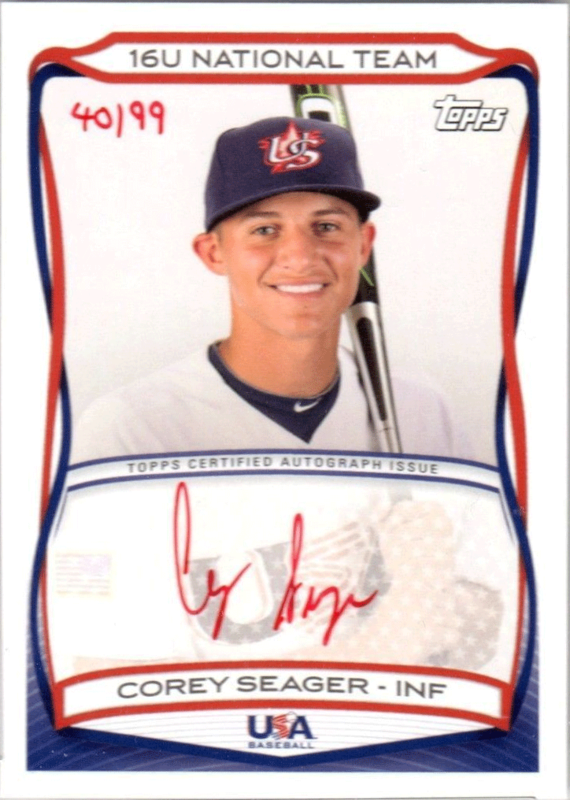 Those cards have been stamped and individually numbered on the front of the card (on the bottom right of the photo). 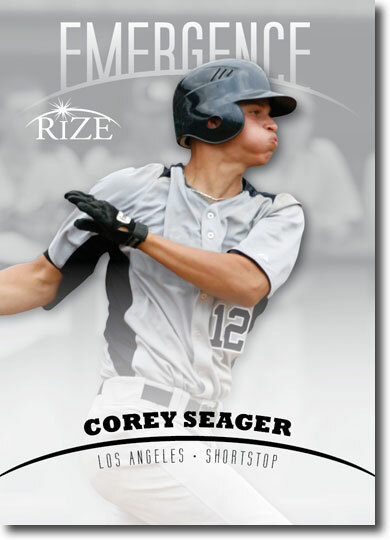 To avoid confusion I have included pics of card created in 2011 (left) and the card distributed into packs in 2014 (right). The card below is Corey Seager's first official card created by a licensed manufacturer as a Dodger. 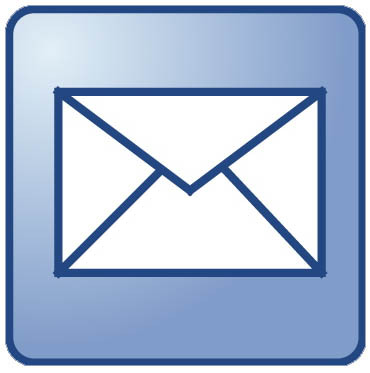 Therefore, it is likely to be one of his most sought after issues. 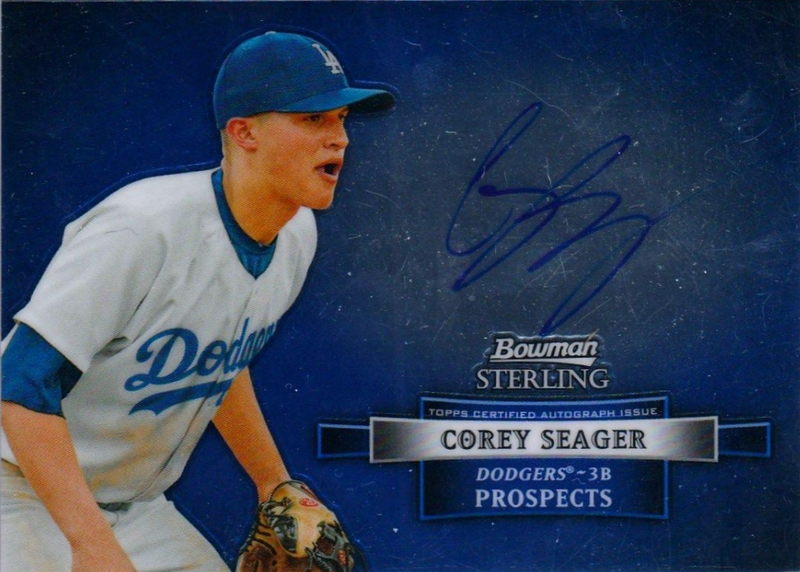 Seager is also in Topps 2012 Bowman Sterling Baseball card set. 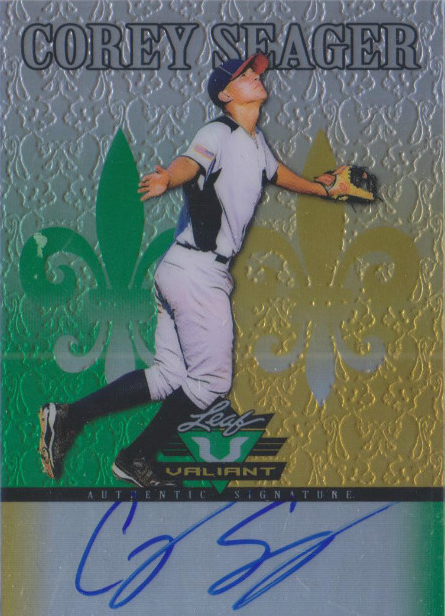 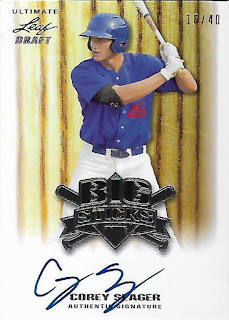 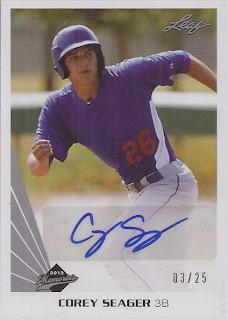 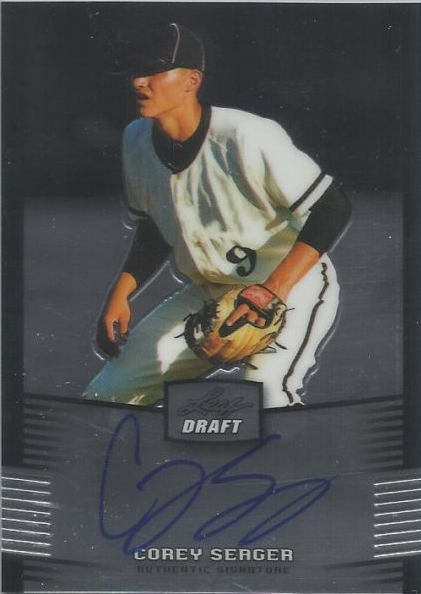 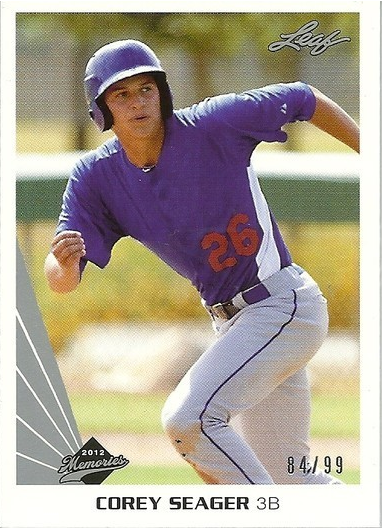 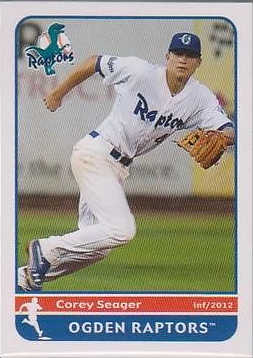 Corey Seager also has a minor league Baseball card from 2012. 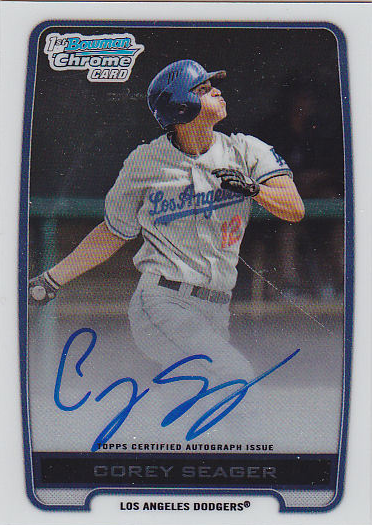 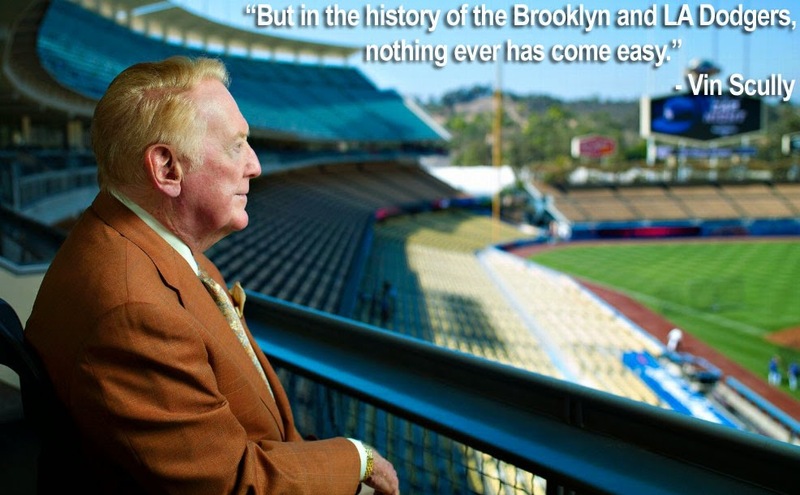 It is from the Ogden Raptors - an Advanced Rookie league team for the Dodgers. 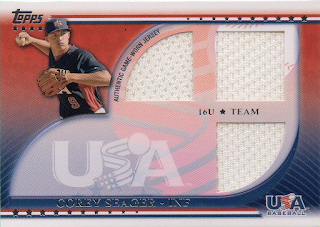 From here we run into a slew of unlicensed Baseball cards; including Leaf and Panini. These next cards are one of the more unusual and suspect cards in the hobby. 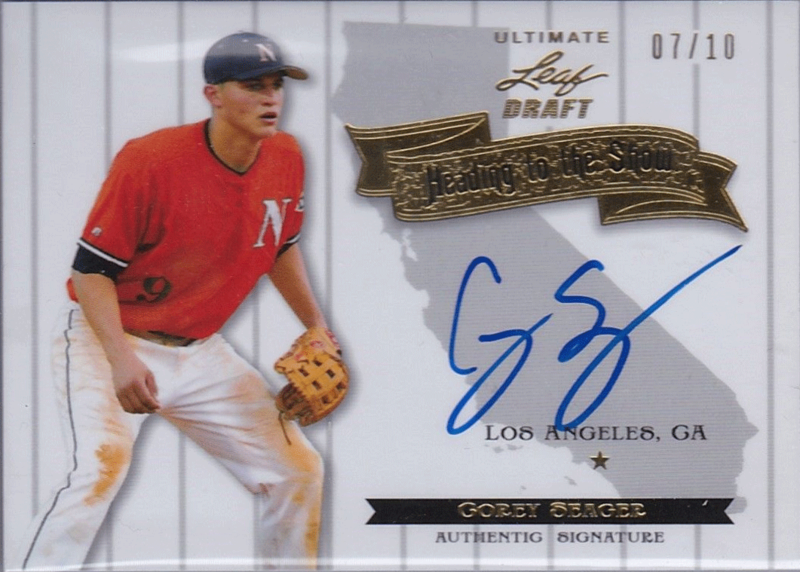 I write this because as far as I know they were never distributed through unopened packs of cards. 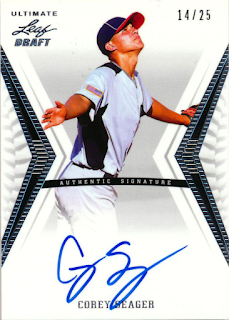 Instead, they appear to have been only available through eBay sales and select dealers. 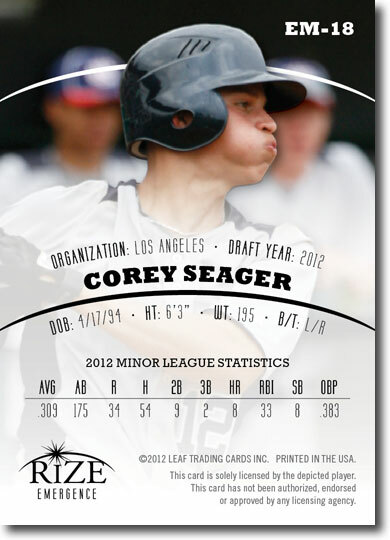 BTW, they were actually printed by Leaf cards for a client who purchase a license from them. 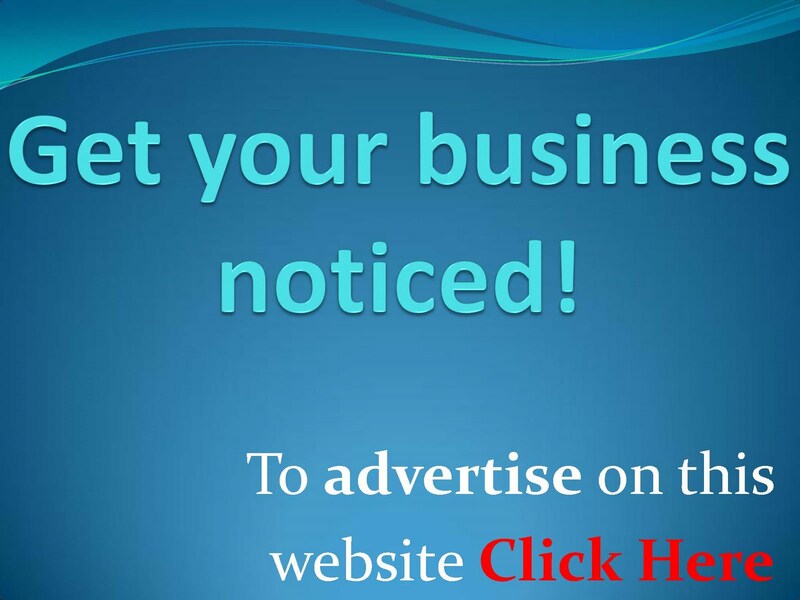 Nevertheless, I would be suspicious of paying too much for them. 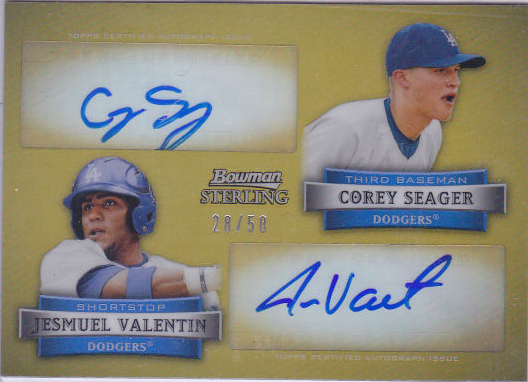 Go here to check out my original story about these cards.